On the musical front, I thought for a long while on how I should approach the album. Should I do a fusion of programmed tracks with acoustic playing like I do with most of my own productions, should I completely deconstruct the songs, should I make modern club versions, should I stay true to the originals, etc. Truth be told, from the time we finalized the list of songs and until the time I am to deliver the mastered recording, I don't really have a lot of time, so I am limited in terms of what I could do if I were to modernize and program the tracks. I'm very slow at programming and sussing out arrangements, and it is not something I do that well compared to so many other artists, so I decided instead to concentrate on the pool of extraordinary jazz musicians I am fortunate to know and work with here in New York through my husband's (jazz trumpeter Alex Sipiagin) associations, and see what they can bring to the tracks with their playing, as well as to focus on what I'm good at, which is my vocal interpretations and background arrangements. Especially listening through all the originals, I am falling in love again with the acoustic and analogue sounds that are so rich and organic compared to the tinny digital sounds we are currently inundated with that somehow seem so redundant and meaningless. These are songs that carry a message, that have rich harmonic structures and are, in my eyes, classics, and rather than to completely deconstruct, redo and modernize them, I would rather take a more respectful route and keep true to most of the songs, but being careful not to sound like a covers band doing poor imitations at your local bar. Of course with some of the songs I can't resist reworking the chords just to jazz it up a bit. 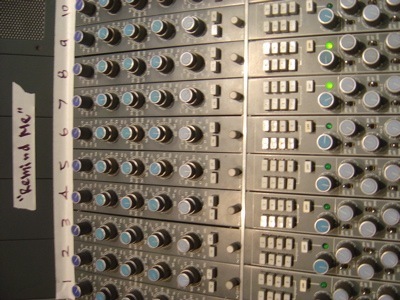 With the idea of making this a completely acoustical recording, I also am being careful with my selection of studios this time around, and am working with two new studios that offer vintage desks and preamps such as API and Neve. After recording and doing roughs on three tracks, I'm really happy with the sonic results and am looking forward to doing the rest. While the term "rare groove" comes to mind, I am viewing this project as "BARE GROOVE" -- stripping all the digital and programmed elements for an organic approach that will be rich in music and sonic offerings. As always, my great friend and long time engineer Dave Darlington is holding down the sonic fort, and the album will be mastered by one of the greats, Mark Wilder.